Checkout new Fort Fido member Zariah! She is a five month old, fifty-five pound, Black Russian Terrier. 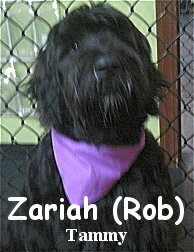 Zariah is a positively stunning dog and she happens to be the first Black Russian Terrier we have come across. What a neat breed! Zariah was more than happy to meet and greet with The Fort's pack, while having her assessment in the Medium Roll. She played well with several other canines and took much pleasure in her stay. We hope to meetup with Zariah again in the near future. Here is a superb clip of Miss Zariah in the thick of it all. Yeah, that is good... Poor D, keep your chin up! Precocious Porter & Contest Voting! We're back on the air--with three new buddies! Cortez & Pippin finally cross paths! Doggie clips and some great rescue stories!